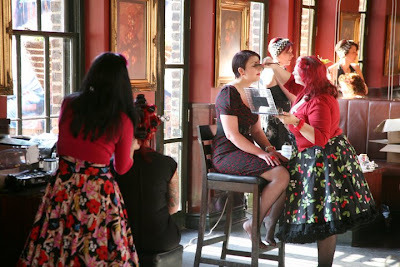 Recently it dawned on myself and my partner in glamour Lilly Von Pink that our business The Vintage Pamperbox has just had its third birthday. The Vintage Pamperbox is 3 years old! Yes over three years ago we started running private and public events teaching ladies everything they need to know about old school glamour.Its been quite the ride! 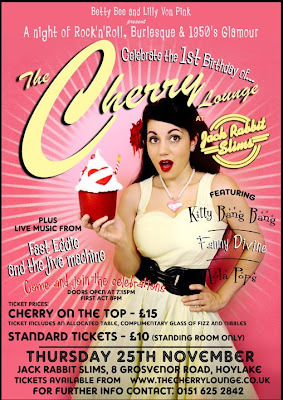 The torch paper for the pamperbox was lit during our time running Burlesque event The cherry Lounge. 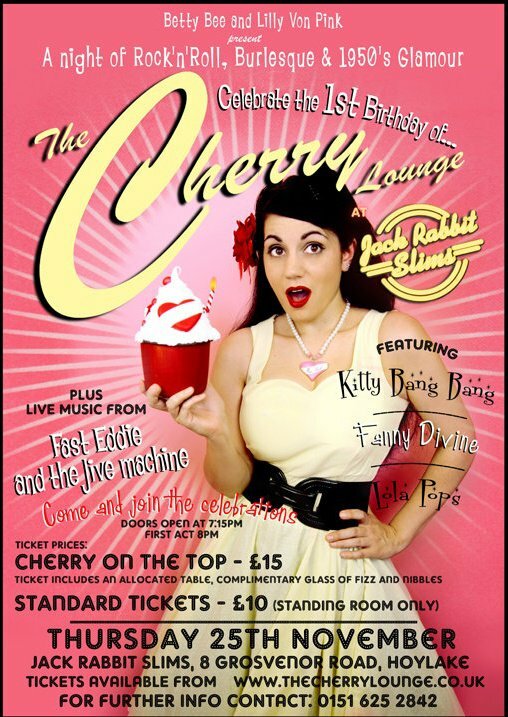 It was Wirrals foremost Burlesque event and we would often get asked by ladies attending where they could learn to channel some 1950's style and if we knew of any beginners burlesque classes. We decided to run one event on a rainy Saturday afternoon and put out a few facebook shout outs. To our surprise it was a huge success and the idea caught on like wildfire. Since them we have become the number one supplier of these type of events in the North West, have featured in the press during Women's Business month, been in various magazines and have sprinkled some of our magic make up dust on everything from hen parties to corporate events, film shoots and photo sessions, with our most recent being a fabulous calender for Manchester based company Pin ups in Pinnies. Building the business hasn't come easily and myself, Lilly and Mr Bee (who takes all the stunning photographs which have become our trademark) have worked extremely hard, however the key to our growing success is without a doubt the friendship we share. Its extraordinary what two women can achieve if they put their minds to it. Ready for Birthday cake. Dress by Sohos, Headband by Diablo Jo. So often we hear that women can be "bitchy" or "unsuportive" towards one another but if our continuing business growth is a testament to anything its to the fact that women working together actually rock the house. Lilly and I may want to look like fifties film stars but we are also mums to very young children, both run other companies and know that modern life can be stressful and hectic, that's why when you walk through the door at one of our Vintage Pamper events we try and create a little cocoon for a few hours where we all leave our worries behind and simply revel in being glamorous, sassy sirens. We are still as enthusiastic about the business as we have ever been and it never gets stale. Our latest venture is a Horror Gore Pin up workshop we are offering on the 13th of October. 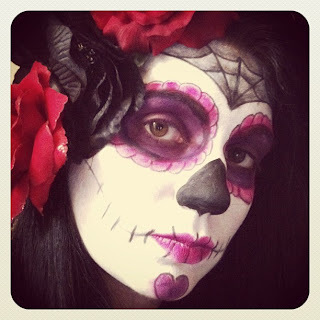 We are both Halloween nuts and Lilly loves doing everything from corpse bride to Day of the dead make up so it seemed a natural fit, its fair to say we are both quite giddy about our planned glamour/gore mash up.Click here for details. 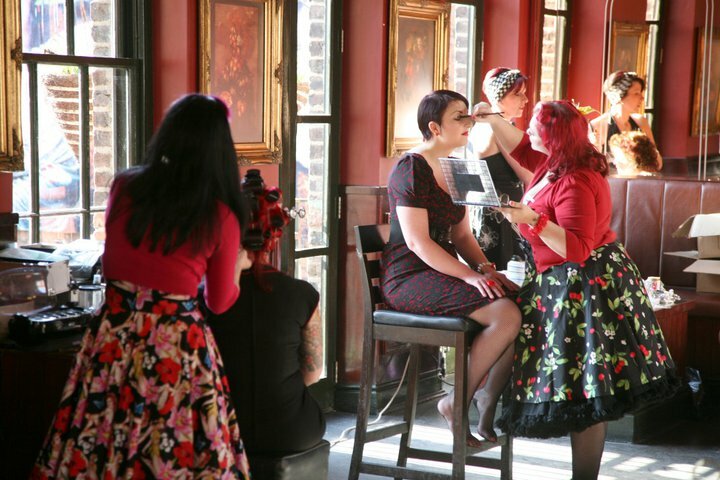 We also continue to receive bookings for hen events and parties, see a group of women looking impossibly glamorous in a vintage stylee in Liverpool on a Saturday night, chances are they have been to a VPB. To celebrate our three year milestone we shot a photo shoot with the theme "Magical make Up Wonderland" I love the pictures and hope you do too. For us make up does hold a certain alchemy.The ability to quite literally transform, make up can make you feel confident when all around you is going to crap, at times its almost like a suit of armour, painting on a smile. In its purest form its just great fun to play with! make up has a certain alchemy to it. So please join me in raising a china tea cup to woman in business and to The Vintage Pamperbox-Long may she sail! Thank you so much to the wonderful Sohos who provided the frocks for this shoot and Diablo Jo who provided my lovely head scarf. We also filmed some of this photoshoot and had a little chat on camera about the past three years.